Intentional leaders get results. Intentional leaders engage staff and unlock their potential. Learn to be Radically Intentional with Scott HR. Smart leaders want engaged workers. Engaged workers are actively connected to their company and work to drive the organization forward, but they only represent about 15 percent of all workers worldwide. The Radically Intentional Training series from Scott HR teaches you how to dramatically improve your office culture, communication, and productivity. You can improve employee engagement, enhance communications and make a real difference with one-on-one coaching. Spend less time managing staff with intentional commitments and informed planning. Become a more effective manager with Radically Intentional Training. As a director, leader or manager, it’s your job to unlock the potential within your staff and hire the best candidates possible. Your day is filled with deadlines and noise, rushing from one task to another, putting out fires and making do. Better than anyone, you understand the illusion of working hard without making noticeable progress. The Radically Intentional Training series is a learning experience is designed for business owners, CEOs, leaders, managers, and HR directors. The five-session training explores the difference that radical intention makes in hiring, training and keeping stellar employees with HR Expert, Kristin Scott. Radically improve your approach to employee management with skills, tips, and tools from Scott HR’s Radically Intentional Management System. This learning experience will show you how to streamline time-consuming employee management tasks while dramatically improving their result. Your time is valuable. Each section of this fast-paced, upbeat learning experience focuses on the most important and impactful topics in human resources. You’ll come away with an energized and refreshed understanding of employee management and armed with effective recommendations you can implement immediately. Research shows that we are more likely to remember experiences, rather than just information, so this learning experience includes group discussions, role-playing, and homework to complement each HR topic in an interactive way you won’t soon forget. Employee Relations – Have happier, more productive employees with intentional (and easy) relationships. Hiring – Hate hiring? You’re not alone! Make the right hire for any job without losing quality candidates along the way with clear communication throughout the process. Onboarding – Keep new hires from leaving and help them become effective employees 10 times faster with intentional training. This is the single most important part of hiring employees! Shared Vision – Leverage the magic of one-on-one employee coaching to enhance communication, improve performance and exceed goals. 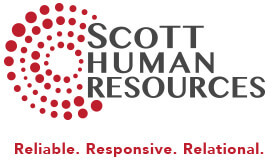 Scott HR’s proven techniques are effective, simple and realistic. Your enthusiastic HR expert! After more than 19 years in the human resource industry, Kristin is motivated by providing real solutions for HR challenges and building relationships that last. She believes that the best choice an executive can make is to invest in themselves and their team with training, education and continued support. Skill development and learning should never stop! Complete this form and Scott HR will contact you soon!